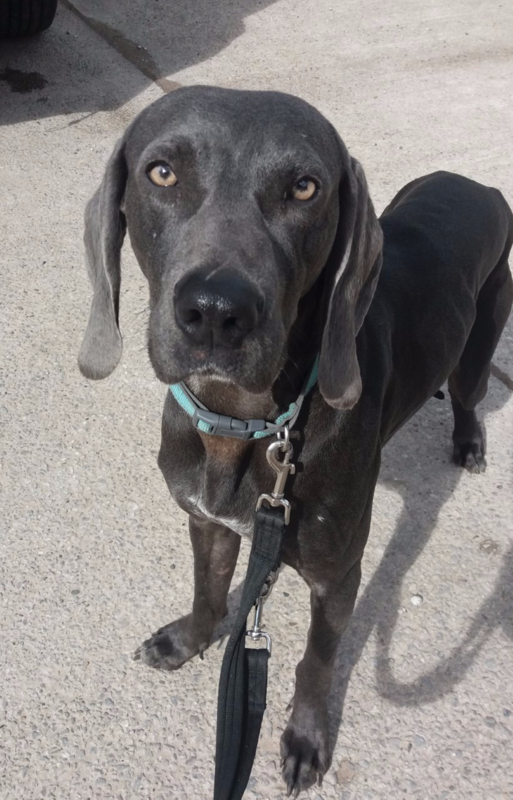 This stunning looking boy is Ronnie, he’s approximately 18 months old, and is a GSP x Weimeranner. His vaccinations are up to date and he is chipped but he will need castrating as soon as possible. He happily sleeps in a closed crate at night and travels well in the car. He has lived happily with other dogs, a pony and small children so is very friendly. He will need taking back to basic training, including learning to walk on a lead as he was mainly allowed to run free. He is energetic and loves running about, he would make a lovely cani cross dog as he is so enthusiastic, he needs a patient home where he can have consistency in his training. He does have slight separation anxiety and prefers to know people are around. If you can offer a loving home to Ronnie please contact Kath on 07759773721 or email kathbreth@hotmail.co.uk.